Florence Parly goes to Egypt at the end of the week. It will prepare the next visit of Emmanuel Macron planned at the beginning of the year during which Cairo could sign new arms contracts (Rafale and corvettes Gowind). For France, the Paris / Cairo axis remains very important in the Near and Middle East, a region marked by an extremely unstable geopolitical context. Having received in October in Paris President Abdel Fattah al Sissi, Emmanuel Macron should also visit early next year, in late January or early February, according to our information. The Head of State had explained to his host that he wanted to continue the relationship of trust between Egypt and France.This is why the Minister of Armed Forces, Florence Parly, has on her agenda a trip to Egypt at the end of this week, which will be used to prepare the next visit to Cairo by the French president. 12 or 24 Rafale in Egypt? In addition to bilateral relations, Abdel Fattah al Sissi is expected to sign new contracts in favor of French arms manufacturers. Like Qatar, which has recently lifted an option for Rafale 12 , Egypt should also acquire 12 or 24 additional French fighter planes. The number of Rafale is still under discussion between Cairo and Dassault Aviation. In February 2015, the aircraft manufacturer signed in Cairo its first Rafale export sale (24 in total). In any case, Bercy no longer blocks negotiations at the request of the Elysee. According to our information, it was Foreign Minister Jean-Yves Le Drian who went in mid-November to bring the new French proposal to Sissi in Sharm el-Sheikh, where the youth forum was being held. The two men maintain very good relations of trust. Negotiations between the Egyptian Army and Dassault Aviation started in early 2016 for the purchase of additional Rafale. Naval Group is also in the starting blocks for the sale of two new Gowind corvettes of 2,400 tons, equipped with its fighting system, the Setis, after the four sold in 2014 . Two corvettes that could be made in Lorient. Cairo is still very interested in this acquisition. For three years, Egypt has launched the modernization of its armed forces with the support of France. Paris is committed to providing new equipment, particularly to the Air Force (24 Rafale, a military telecom satellite) and the Navy (four Gowind corvettes, one FREMM, two BPCs). This represented nearly seven billion euros (6.83 billion) contracts for the French arms industry between 2014 and 2016. Bregs and BON PLAN like this. DAC O DAC, Picdelamirand-oil, shaktimaan and 1 other person like this. Even BJP members have to voice concern, over the dismal performance of the government wrt the defence modernisation, including the Rafale deal. Its fleet of fighter jets dwindling, the Ministry of Defence (MoD) is set to float a fresh global tender inviting military aviation companies to make fighter jets in India. The move comes as the Air Force is now down to 31 squadrons against the need of 42, as mandated by the Cabinet Committee on Security. Each squadron has 16-18 planes. The request for information (RFI), the first step in the tendering process, is being finalised and will be sent out to global players, sources said. Companies that participated in the now scrapped Medium Multi-Role Combat Aircraft (MMRCA) project will be invited. 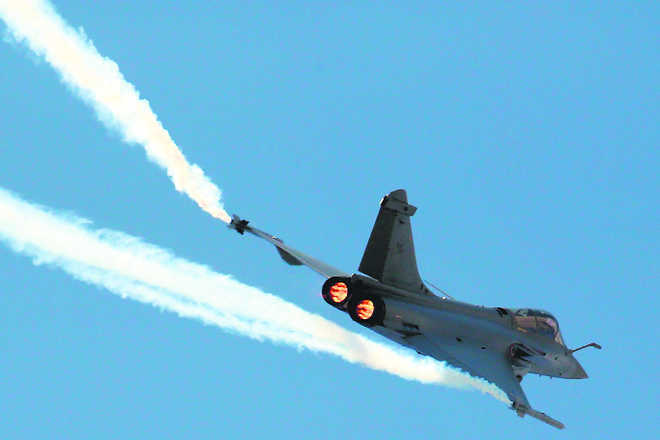 The MMRCA project for 126 jets did not fructify and the government, in April 2015, announced the move to buy 36 Rafale fighter jets from French major Dassault. The MoD and the IAF will keep its options open and not restrict itself to say a “single engine” fighter jet, sources have told The Tribune. The option will be to get a “fighter jet” and it will not specify the number of engines as that then restricts the options. These will be under ‘make in India’ and to get global manufactures to have a production line in India, the project needs adequate numbers with possibility of future expansions. To speed up matters, the MoD will be looking at new additions made by global players since the MMRCA trials were carried out in 2011. The planes tested then were Lockheed Martin’s F-16IN, US Boeing’s F/A-18IN, Eurofighter Typhoon, French Dassault’s Rafale, Swedish Saab’s Gripen and Russian MiG-35. In past two years, the IAF and the MoD were in talks for a “single engine” fighter jet with two global manufactures. However, this has been superseded by the thought process to just focus on getting additional jets without getting into “single engine” or “twin engine” variants. The existing production of 123 Tejas fighter jets being made by public sector giant Hindustan Aeronautics Limited is just taking off and it will take more than a decade for the entire lot to be manufactured. The IAF has the mandate to have 272 Sukhoi 30 MKI in its fleet. The MiG 21s are on their last legs and have to be phased out. Btw, interesting that the US can block Scalp sales. Not so independent after all? E-2Ds for French Navy, French Army is considering Brimstone and possibly light attack aircrafts, to be independent from expensive Rafales of the Air Force..., many interesting reports this year already.